If you are heading into the Lacrosse season and looking to step-up your game, try training like the pros. Star Lacrosse players are stepping outside of the “traditional” training box and exploring new ways to up their stamina and increase their performance on the field. From Cross Fit-like routines to Superhero-like movements, star Lacrosse players are training in the most innovative and creative ways. It’s a classic, I know. But rope climbing is still one of the best strength training exercises for any type of athlete. A full-body workout, simply climbing a rope from the end to the top trains your triceps, biceps, and obliques all while strengthening your core, which is great for improving your stick skills. This is a great training exercise for the whole Lacrosse team, and awesome for a rainy day. If you are training in the gym, position yourself at the bottom of that rope and start climbing. Aim to get up a fifteen-foot rope as quickly as you can. 30 seconds? No problem. If you can make it in 15 seconds, you’re at a professional level. Can you handle the 50-pounder? You might not be there yet, but you’ll get there. Grab your medicine ball of appropriate weight and work on some circuit training. Try a circuit that starts with a push-up with your hands on the medicine ball, and then move into medicine ball slams and eventually into press-ups (or even wall balls, for you Cross Fit fans out there). A circuit like this with a medicine ball trains your hip flexors, triceps and deltoid muscles. 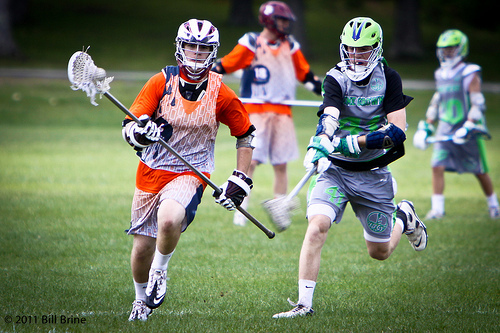 You will improve your Lacrosse strength, power and foot speed. If you want to train like the best Lacrosse players in the country, grab your sleds. Not for the snow, of course. It’s spring, after all. Grab your weighted sled and attach a pull rope. Get yourself into a push-up position (one handed, of course) and grab the rope attached to the sled with your other hand. Feeling strong? Rotate from one side to the other pulling the sled towards you while in the one-handed push-up position. This move increases your upper-body strength working your chest, triceps, traps, deltoids and obliques all at once. If you’re feeling like working up some Superhero strength for the Lacrosse season, grab a sledgehammer and a monster truck tire. Think I’m joking? Rotate between circuits of movements like an overhead slam into a side slam. This is great for your shot speed during the Lacrosse game, and is amazing for relieving some tension. A strong core and good posture is essential for sledgehammer exercises. Work your shoulders, biceps, legs, and core all at once. There’s nothing like a full-body workout to get your pulse up. This is great for your balance as well. All of these moves are great for training like a pro. Whether you are looking for moves to get your own Lacrosse game going or looking for an addition to your team’s workout, any of these workouts will help you increase your endurance, speed, balance, and overall strength. Grab a sledgehammer and start swinging - after all, it's how the star Lacrosse players are training.